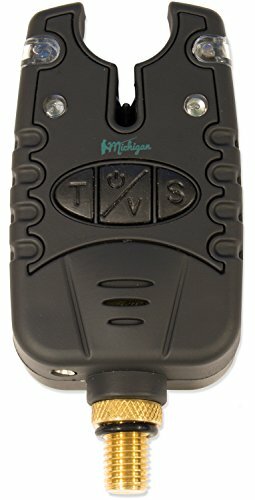 This MICHIGAN® black carp and pike fishing bite alarm comes with 4 level settings for sensitivity, time and volume, allowing this to be suited to your individual needs. Also has a drop back function and is fully CE approved, providing you with peace of mind that this is a top quality MICHIGAN® product. It is also waterproof, so is perfectly suited for use in all weather conditions. Night light sensor activates when you have a bite, an amazing addition that sets this apart from other bite alarms on the market. Also comes included with a jack plug for swingers. Made from ABS and designed to withstand the outdoors for years of use, it has an extremely compact design (8.8cm (3.5") x 4.5cm (1.5") x 3cm (1")) which helps with storage. Uses 1 x LRV08 battery for power (not included).